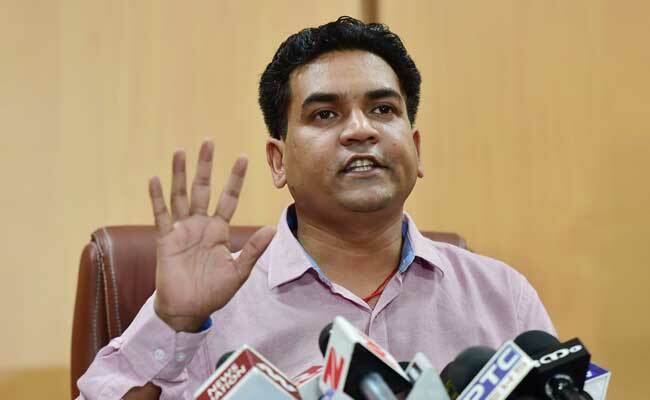 Arvind Kejriwal Sued By AAP Rebel Kapil Mishra Over "Low Attendance"
Kapil Mishra also sought in the plea that Arvind Kejriwal be directed to frame rules in the Delhi assembly, making 75 per cent attendance mandatory for all legislators. New Delhi: Aam Aadmi Party rebel lawmaker Kapil Mishra has moved a plea in the Delhi High Court against Chief Minister Arvind Kejriwal, seeking orders that the AAP chief attend assembly sessions more frequently. Targetting him for "low attendance", the former Delhi minister also sought that Mr Kejriwal be directed to frame rules in assembly, making 75 per cent attendance mandatory for all legislators. Responding to Mr Mishra's allegations, AAP leader Sanjay Singh wrote on Twitter that he will move a similar plea against Prime Minister Narendra Modi. Mr Mishra, in his plea, urged the court to "direct the Lt. Governor to ascertain feasibility of 'No Work, No Pay' for the MLAs, if presence is less than 50 per cent in the assembly." He requested the court to issue directions to Lieutenant Governor Anil Baijal and the Speaker of the assembly to ensure the presence of Mr Kejriwal in the house. He also added that Mr Kejriwal should respond to questions related to public welfare. "He (Mr Kejriwal) needs to inform the people of his constituency and also all the citizens of Delhi how well he performed against indicators like attendance in the assembly, the number of questions he replied, his understanding and appreciation of the different policies and laws that he made, the time that he spent in consulting their constituents, how well he oversaw the executive and a statement disclosing his income and assets," the plea said. "Last year, the Delhi Assembly had 27 sessions but the Chief Minister, who is also the Water Minister, was present in seven only. It is not out of context to state that Delhi faces water crisis every year," the plea said, adding that during question hour, Mr Kejriwal was never present in the assembly in the last 40 months. He said in the plea Mr Kejriwal's absence showed "how serious the Chief Minister is in discussing matters related to the people". AAP parliamentarian Sanjay Singh responded to Mr Mishra's allegations in the plea, saying why he had kept mum on alleged obstructions by PM Modi and Lieutenant Governor Anil Baijal in the implementation of various projects of the Delhi government. "I am filing a case in the high court for getting Narendra Modi's attendance and ensure his presence in Parliament. Why does Kapil Mishra keep mum on Modi who obstructs every work by Delhi government?" Mr Singh tweeted in Hindi. In another tweet, he said despite appeal by the entire opposition, PM Modi doesn't come to parliament.